If you have an SUV (sports utility vehicle) such as the Ford Explorer, Toyota Land Cruiser or Range Rover, one of the most important thing that take you to your destination safe and sound are your SUV tires. You can take your SUV on any kind of terrains-rocky, sandy, rolling hills and many others – and your tires take a lot of beating for it. This is why it is very important that you take care of your SUV tires. When you take your SUV’s on off-road adventures, your tires will have lots of dust particles, dirt, mud, and some soil which not only makes you tires dirty, they also make the tires brittle. Having dirty tires is not only unpleasant to the eyes, it is also unpleasant to the riders. It is important that you always clean your SUV tires. Do not use highly synthetic cleaners for your tires because many of them make your tires acidic which will easily ruin your tires. Instead of synthetic tire cleaners, you should use a mild detergent you use at home. just mix the liquid detergent with water and then use that mixture to clean your SUV tires. Like all other tires, you should also check the air pressure of your tires. Having deflated tires is one of the main causes of flat tires. Also, schedule your SUV for a wheel alignment and balancing test. If you always use your SUV, you may need to have your wheels aligned and balanced. Also, rotate your SUV tires at least every 2 months. Put the front tires at the rear and put the rear tires in front. 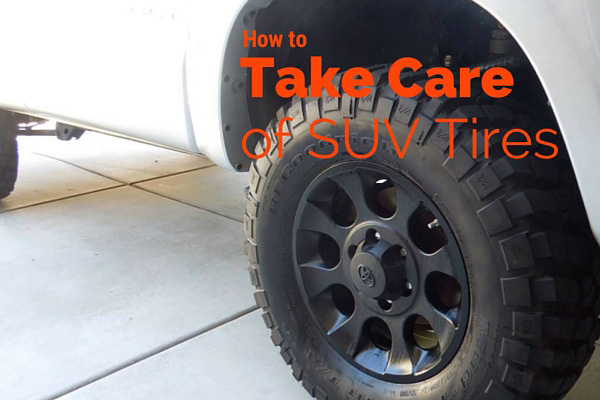 Take care of your SUV tires as you take care of the other parts of your SUV. They are essential to you because if they are in good condition, you will have a very good ride and you will be sure to get to your destination with no hassles whatsoever. Your Ford Explorer, Toyota Land Cruiser or Range Rover will not be good SUVS if you don’t have good SUV tires.